Rebecca Evans AM, the Welsh Government Minister with responsibility for Active Travel, is using the launch of a new campaign by Wales’ leading walking and cycling organisations to urge people to have their say on how their communities could be better designed for getting around on foot and by bike. 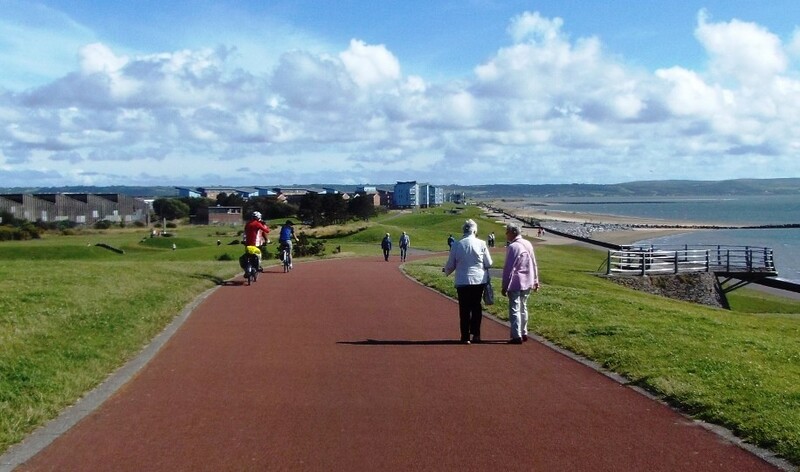 Because of Wales’ world leading Active Travel Act, local authorities will shortly be developing long term plans for walking and cycling networks that will make it easier and safer for people to opt to walk or cycle rather than use the car. Cycling UK, Living Streets, Sustrans Cymru and Welsh Cycling have joined forces to make it easier for people to get involved in the process and have their say on where new or improved routes are needed and how communities can be designed to make them more people friendly. The organisations are launching a new webtool that will allow people to enter their details and automatically send an e-mail to their local authority asking to be involved in drawing up the new maps. Providing effective active travel infrastructure is much more than dedicated cycle lanes and footpaths. Properly designed, the networks will incorporate plans for more pedestrianised areas, streets where children can play near their own front doors, better access to urban green spaces and spaces structured to ensure that motor vehicles give way to people. This is why it is essential communities and individuals are involved in planning the networks at the earliest possible stage.